Recording Connection mentor Conrad Osipowicz is the chief engineer and owner of Blue Room Productions. With nearly a decade in the business this audiophile and seasoned drummer has got a wealth of knowledge to share on just about anything to do with music. In fact, he’s so well-versed in various aspects of sound, engineering, and recording that a conversation with him can range the gamut from talking about product testing at Cakewalk, to doing working as a Live Mix Director for a radio station in Boston, to working with acts like Dave Matthews Band, Regina Spektor, The Pixies and Genesis (the Matthew Shell and Arun Shenoy collaboration). He’ll even tell you about his rare Polish monitors, seven-foot-tall Lipinski Signature monitors to be exact, then there’s the Neve consoles, Neumann tube mics, vintage compressors and the list goes on and on. Well passion, experience and an entrepreneurial mindset has paid off for Conrad. 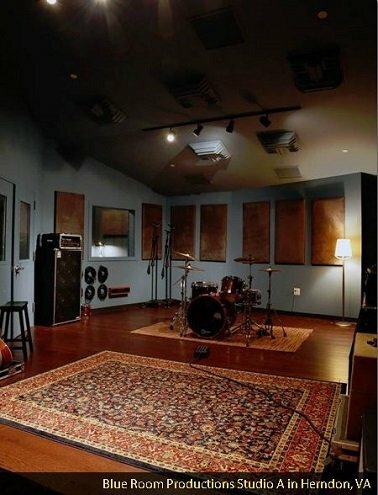 Things are going great, so great in fact that he’s opened a second studio in Herndon, Virginia where he intends on sharing his knowhow with a couple fortunate Recording Connection apprentices while offering affordable, high-caliber services to local artists. 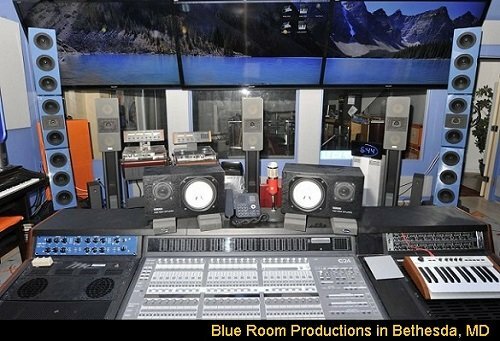 The original Blue Room Productions studio in Bethesda, Maryland (thirty minutes outside of D.C.) will continue going at full throttle, recording and engineering DC area artists, bands and even offering ADR for voiceover talent. Considering there’s so much great stuff going on with Conrad, we recently caught up with him to congratulate him on the opening of Blue Room Productions in Herndon and to glean a few insights about building his business, managing clients, and more. About end of 2008, beginning of 2009 I came back to the DC area, where I’m from, and I started the first studio, Blue Room Productions, in Bethesda, Maryland. It started as an empty room and slowly added equipment and software, a vocal booth from EBay. At one point the Whisper Room booth. And one piece at a time, just kind of recording a couple sessions, two or three weeks and then buying a new mic on EBay and then, recording another week or two and buying a new plug-in online. Just kind of really, really kind of piecing whatever I could. A lot of my funds, all my resources, all my effort and my free time went into the studio. And you know, now it’s six years later. First of all, the studio is honestly one of the top studios in the area, in DC…And I’ve got, I buy, at this point, some of the best mics, best preamps, best vintage compressors. You’ll find even some very rare pieces and seven foot tall Polish monitors, Lipinski Signature monitors Polish made, and so, some really unique items that you might not find at any other the studio on the East Coast. After six and a half years, the second Blue Room Productions opened…So, this spring and this summer will be really busy because we’ll have two studios running simultaneously to accommodate different types of artists and people in different areas around the DC area with slightly more affordable hourly rates there… So, [we are] really trying to give options to musicians and other producers and even freelance engineers who’d like to rent the studio and those types of people here in the DC area. Because, it’s not nearly as competitive here as it is in New York, or Nashville, or LA where there’s a studio on every block. Here, it’s completely different, as you can imagine. ON WHAT GOT HIM INTO AUDIO ENGINEERING: I was always interested in computers and technology. I produce, too. It’s not that I exclusively engineer…I’ll produce with full bands and indie rock bands and up and coming artists here in the DC area, but I was definitely more inclined on the technical side of operations — using the right mics, the right outboard gear, the right software and plug-ins…I was always that way ever since a young age, more into the technology side. I played for about 15 years. I played a lot of rock, pop, reggae, hip-hop, jazz, whatever I could get my hands on. Lately, actually for the last two or three years, I’ve been playing in a Tool cover band with drums. Wild Eyes is the name of the band. And we play all around the DC area, Baltimore, Virginia…It’s pretty casual. It’s pretty much just for fun, recreationally. I guess my primary instrument now is probably the mixer in the studio. That’s where I spend the majority of my time. But when I have a chance to get behind the kit and play a bit, I really enjoy it. But, to be honest, I think I’ve definitely kind of converted more into the engineering side of things being on the other side of the glass instead of being a performer recording. I think a lot of people are under the impression that you need to gear, you need this, you need a plug-in and then you can you know, make a hit. And, that’s not the case. That’s not how it works. It’s the experience and the ability, at least with live instrumentation. Maybe it’s different if you’re an electronic artist or a producer and [there are] a lot of things you could do on your own, and just sequence with media and quantize everything and it’s a lot more simple. But, if you’re recording a live band or a live singer in a booth, you got to know how to talk to them, how to interact with them, how to criticize them when it’s appropriate. How to use your judgment and know when to say something, when not to say something, when to zip your lips and when to open your mouth and tell them that they’re out of tune or out of time, or they should do things differently. It’s a difficult trait to learn and I’m still learning that every day. You know, it’s not just having the gear and you’re quitting the expertise…If you want to work with others, this is an industry of collaboration and communication with others: producers and engineers, and artists, and graphic designers, and photographers and all different people in the music industry: videographers, directors. You need to know how to interact with people. New Recording Connection Mentor: Matt Linesch of Ocean Way Recording!